You are probably someone who takes a lot of exercise, possibly in the form of running. Running is a common fitness activity and it’s a great way to get in shape, but it can also lead to injuries that diminish pleasure in exercise. As the popularity of this activity continues to increase, knowing about running-related injuries and how to prevent them can keep you on track toward reaching your fitness goals. Most injuries are caused by overuse – a result of applying repeated force over a prolonged period of time. Acute running injuries are rare and consist mainly of muscle injuries, sprain, or skin lesions (like blisters and abrasions). Achilles tendinitis – This injury is marked by dull or sharp pain along the back of the Achilles tendon, calf tightness, and early morning stiffness. Proper stretching can help prevent this injury. For treatment, rest, and stretch until the pain is gone. Plantar fasciitis – This injury is an inflammation of the plantar fascia –a thick connective tissue which supports the arch of the foot. For prevention, proper stretching is recommended. If pain occurs, anti-inflammatory medicine, stretching, and ice compresses help relieve pain. Shin splints – This is a painful inflammation of the muscles around the shins –the front part of the leg between the knee and the ankle. These muscles hold the front part of your foot up as the foot descends, then contract as the heel strikes the ground. This is caused by overuse or poor conditioning. It gets worse when you run on hard surfaces. One treatment is to rest from running, then stretching until the pain is gone. #1: It’s a good idea to determine your running goals – Setting goals can greatly help you observe a safe pace and this will keep you from overexertion which can result to injury. You may choose to start running to lose weight, improve your figure, and increase cardiovascular fitness or just to socialize with friends. Whatever reason you have, it’s always a good idea to determine a particular goal when creating your exercise program. For instance, “if you want to improve cardiovascular fitness, you should run at a quick pace to maximize your heart rate.” On one side, “if you’re running to lose weight or reduce body fat, it’s better to run at a slower rate for a longer time.” Depending on your goal, it’s better to decide what exercise program is appropriate. #2: It’s better to have a physical evaluation – There are certain health conditions that can decrease your running performance and increase your risk for injury. Not to mention, arthritis, osteoporosis, and other degenerative joint diseases can increase the risk of injuries for adults. If you have health issues, you should discuss these with your healthcare provider before you start to run. 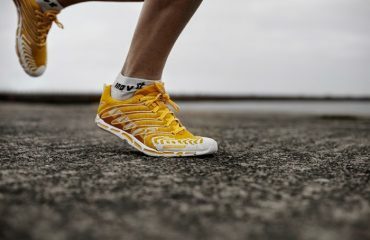 #4: Wear the correct shoes – Choosing appropriate running shoes can help prevent running injuries. Find a shoe that fits your foot type or visit our experts here at OrthoSports to recommend what running shoes are appropriate for you.